TODOS thanks all of its outgoing Board members and positions: Diane Kinch, President; Diana Ceja, President-Elect and Resources Chair; Marta Civil, Vice President; Julia Aguirre, Director; and Rocío Benedicto, Secretary. They have worked hard all year supporting TODOS' efforts. The following new TODOS Board members and positions began their term on April 25th: Diana Ceja, President; Diane Kinch, Immediate Past-President; Zandra de Araujo, Director; Jennifer Yacobian, Secretary; and Susie W. Håkansson, Resources Chair. Welcome to the new board members and positions! The May-June 2018 reading as part of A Collective Call to Action is suggested by TODOS and is one of the focused articles from TEEM 7 Special Issue: Mathematics Education Through the Lens of Social Justice. Go to the title and targeted questions for detailed information. TODOS Live! will continue next year. Look for information on the ListServ for upcoming sessions this spring: expanding the 'Brief Chats with Powerful Resources' sessions will be continuing as will hour content sessions presented by TODOS members. If you have ideas, or would like to be involved contact TODOS Live! The TODOS 2018 Conference includes a variety of session types. The Session Descriptions provide an overview of the session types with links to the various sessions being presented within each section type. There is something for everyone at this conference. Don’t forget to register now! TODOS 2018 is only a month away! The Conference Overview provides a glimpse of the all presentations that will be occurring with a variety of speakers, including classroom teachers, teacher leaders, mathematics teacher educators, and researchers. Sign up now! The Cathy Kinzer Memorial Professional Development Award honors Dr. Kinzer for her lifelong commitment to equity in mathematics. The award is given to an individual to attend the 2018 TODOS conference. This year's recipient is Gloria Brown-Brooks from Hollister, CA. Ms. Brown-Brooks is a math and science teacher at the Santa Ana Opportunity School in San Benito county. She is an active member of TODOS and Chairs TODOS Live! Join the Collective Call to Action webinar on May 24th at 7:00 PM Eastern Time to discuss what teaching and learning with an equity and social justice lens can look and sound like, as Rosa Serratore and Christine Lincoln-Moore from CMC-South explore Teaching Mathematics for Social Justice: Conversations with Educators, edited by Anita A. Wager and David W. Stinson. They look forward to an exchange of ideas and practices. Sign up now! Are You Attending the NM STEM Symposium or CAMT? Will you be attending the New Mexico STEM Symposium in Albuquerque on Friday, June 1st? 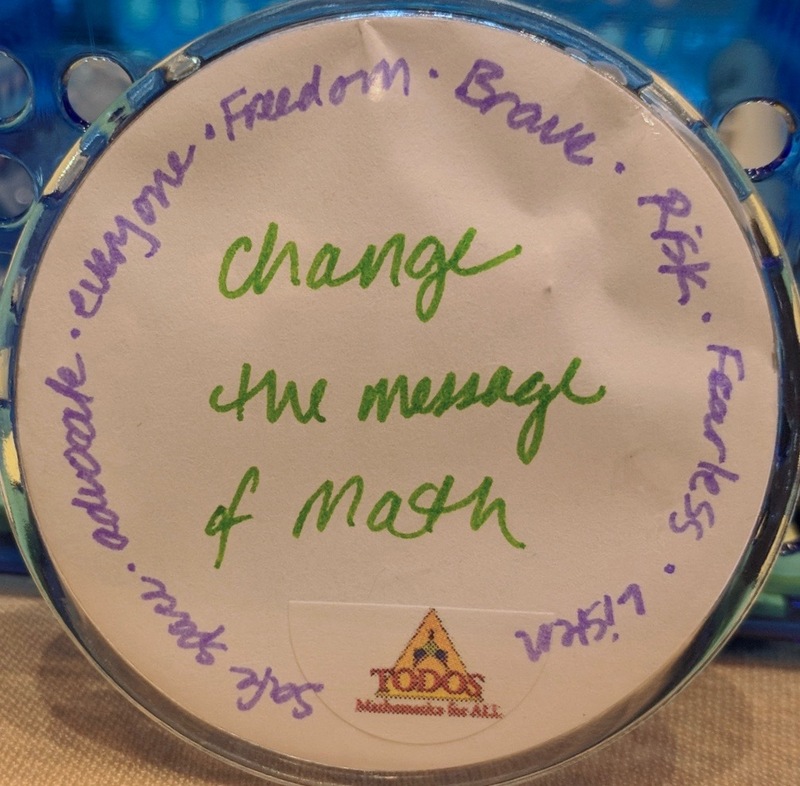 Are you attending the Conference for the Advancement of Mathematics Teaching (CAMT) in Houston, Monday to Wednesday, July 16th -18th? TODOS will have exhibits at both the STEM Symposium and CAMT. Volunteer at the STEM Symposium and/or volunteer at CAMT by signing up to staff the booth for a couple hours. Remember how you learned the alphabet by singing it? What if songs could also help you learn, and better engage with a college subject like statistics? The NSF-funded project on interactive statistics songs was one of 215 innovative STEM education projects featured at the 2018 STEM for All Video Showcase. Larry Lesser, one of the leaders of SMILE, will discuss it at TODOS 2018! Submit a proposal to speak at NCSM in San Diego, CA on April 1-3, 2019. Making Waves with Effective Mathematics Leadership is designed to highlight your influence on and advocacy for creating and supporting exemplary mathematics teaching and learning. Consider submitting in strand “Empowering Equity and Social Justice Leadership.” Deadline for submissions is Monday, June 4th.